Lizzie finds a pair of 4d glasses and is amazed to find they let her look back through time. As she walks along the dockside she sees a variety of startling and unexpected things - not least a missing relative! Start outside Bristol Central Library. Turn left, and walk as far as Partition Street. Cross the road and go as far as the Bag of Nails pub. Cross Jacobs Wells Road and then Hotwells Road. Go along Mardyke Wharf to the Grain Barge. Carry on along Pooles Wharf as far as the Pump House. Turn left and cross the bridge. Lose your 4D glasses in the docks. Go back to the Nova Scottia for a drink. Heads & Tales thanks Bristol City Council for their assistance with the creation of this story, which was recorded by Tony Chamberlain at the studios of Bristol Community FM. 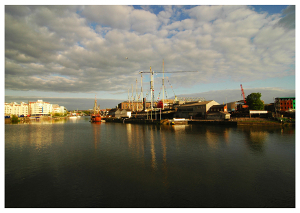 Photograph of Bristol Docks by William Datson.